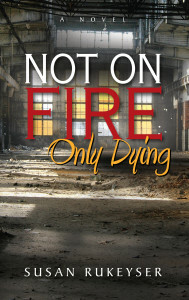 I received this old mixtape in the mail shortly after completing Not On Fire, Only Dying (my debut novel, out Sept 15). It appears to have been made by one Marko Holomek, my book’s protagonist. Marko is a chivalrous, drug-dealing ex-con and a product of my imagination. So it was weird, getting this tape. For years (yup, years) Marko lived in my head and in stacks of unpublished pages. For years he lived with me. When the book was finished, he left. I don’t know where he is now. There was no note enclosed with the tape. No return address. Marko is easy to love, I truly believe it — as damaged and dangerous as he is. Maybe because he himself loves so easily. There is nothing he won’t risk for Lola. 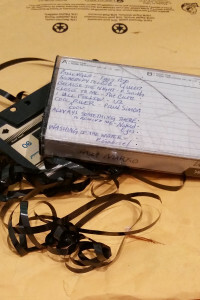 Marko loved the woman he made this mix-tape for, too. She does not appear in Not On Fire, Only Dying. She was part of Marko’s life before this novel, before his twenty years in prison, before Lola. My guess is he made the tape around 1990, when he was worried about this woman’s safety and knew she didn’t love him back. I can see Marko, a young man back then, selecting each song carefully, considering the lyrics and how the music felt. I see him hunched over a dual-cassette boom box. He has a finger poised above the Pause button because pausing before hitting Stop means a less noisy transition. He has a stack of his favorite cassettes and a pack of 90 minute blanks because 60 minutes aren’t enough to say what he needs to say. But he only finished one side. What happened? Some interruption. Marko doesn’t quit, not ever. I like these songs, it turns out. I’ve always liked them. I guess Marko knows me well, too. He sent the tape because he knows I will continue to tell every part of his story, even now that he and I are no longer in touch.